Photo shows ‘Mr. 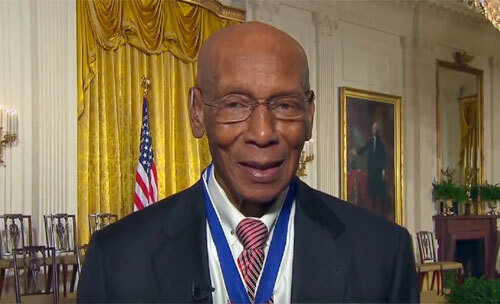 Cub’ Hall of Famer, Ernie Banks, speaking with CNN in a November 2013 interview shortly after receiving the Presidential Medal of Freedom. Banks, famous for hitting more than 40 home runs in five different seasons, was an 11-time All-Star. He was also named National League MVP twice and was elected to the Baseball Hall of Fame in 1977. Sports Speakers 360 is a sports talent agency for booking athletes. If you would like to sports legends like Ernie Banks for a speaking engagement, autograph signing, VIP meet and greet, charity fundraiser or personal appearance, you can contact Ernie Bank’s agent, for appearance and speaker fees or call 1.855.303.5450.